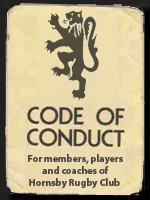 All Hornsby Rugby Club members and players are expected to have read and comply with the Club’s Code of Conduct. Please click here to view the Australian Rugby Union Code of Conduct By-Laws. At minimum all players should be familiar with Section 3 (pages 2 and 3) of this document. The Off-Season Training Program for the Hornsby Lions is now available for download. For further details on any of the information within please see your coach. 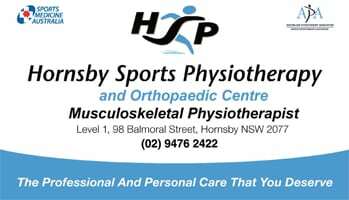 Hornsby Rugby Club is proudly supported by Hornsby Sports Physiotherapy and Orthopaedic Centre. Contact Michael Ho Shon at Hornsby Sports Physiotherapy by phone on (02) 9476 2422 to book an appointment or speak to him directly on any game day as he straps and patches up The Lions. A basic level of insurance cover is provided when you pay your registration fee online through the Rugby Xplorer app. Click here for Rugby Australia Insurance page. Click here for Rugby Australia Player Insurance brochure. All players are advised to take out private health insurance to provide a more complete level of cover. All participants (Players, Coaches, Officials) must be registered in order to obtain insurance coverage. Hornsby Rugby offers a free registration options for coaches, managers and club officials. Players who suffer concussion must be treated in accordance with Rugby Australia’s procedure. It is a requirement that all players who suffer a concussion seek the highest level of medical care reasonably available to ensure concussion is managed appropriately. All concussions should be taken seriously. Children and adolescents must be treated more conservatively than adults. All players with potential head injury or concussion must be removed from the field immediately. Return to play or training on the same day is not permitted for any potential head injury or concussion. Click here for Rugby Australia Concussion management information. Effective injury prevention involves a host of measures such as physical preparation (e.g. conditioning, warming-up, stretching and cooling-down); skill and technique development; use of protective equipment; enforcement of game laws; rule/law changes; and the management of general safety issues by administrators, coaches, referees and other personnel. The following safety tips apply to all players, irrespective of the level of play. New players and those older than 35 years, should consider undergoing preparticipation medical screening, with a qualified and experienced practitioner (e.g. sports physician or a general practitioner with sports medicine interest). Players should be prepared to accept the advice of a sports medicine professional that they should not play if they have a condition that places them at risk of injury. Tackling should be the focus of regular skills training and be progressively introduced to players. Mouthguards should be replaced every two years or when damaged or deteriorated.